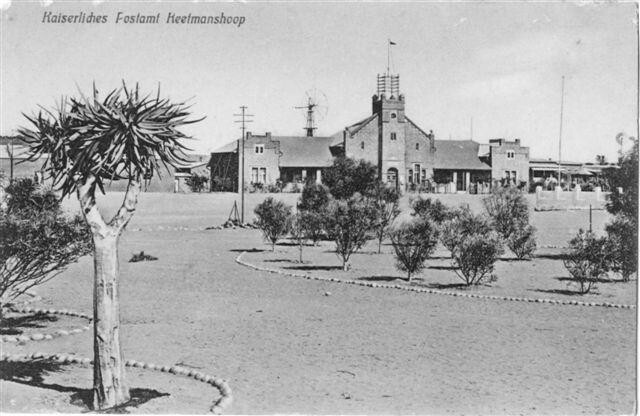 In 1908, Gottlieb Redecker, the official builder of the German colonial government’s Works Department, drew up plans for a new post office building in Keetmanshoop. 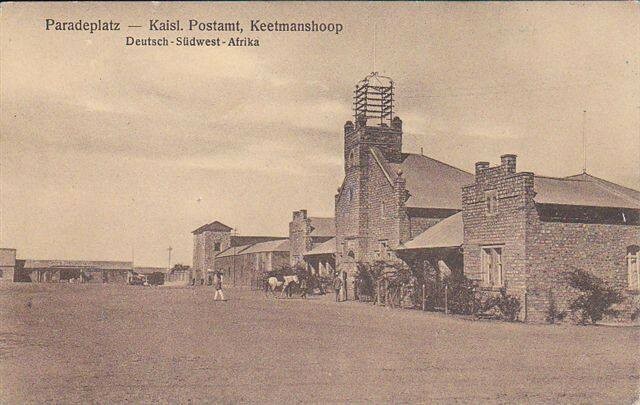 Although Keetmanshoop already had a post office at that stage, it was no longer able to serve its purpose effectively because the village was expanding very quickly with its new status as a railway junction and military and administrative centre for the south. Consequently, the need for a larger post office which supplied not only more office space, but also accommodation for the post office personnel as well as a telegraphic antenna, had increased significantly. The building was erected by the firm Seebach & Bach and completed in 1910, and commissioned on 1 August that year. Like a number of buildings in Keetmanshoop, it is made of granite due to the stone’s durability and low maintenance. Air-dried bricks were only used for the interior. Building wood and corrugated iron were obtained from Cape Town, while the doors and windows were imported from Germany. The building consisted of an anteroom, a spacious hall with reception counters, two telegraphic service offices, a storeroom, an office for the postmaster, and living quarters for two post office officials. All of these rooms can still be seen in the building. The building also features two verandas alongside the central tract, through which the former accommodations of the post office personnel could be reached. The aesthetic façade features a high, pointed gable topped by a broad, rectangular tower. A telegraphic antenna was originally fixed to the top of the tower. Stepped gables, which are smaller than the centre gable, continue the façade in respect of both front corners of the building. The windows at the front of the building are framed with blocks of stone. The small round-arched windows in the central and corner gables enhance the aesthetic value of the building. The Old Post Office Building is situated on the corner of Hampie Plichta and Sixth Avenues. It was officially proclaimed a national monument on 2 February 1987.